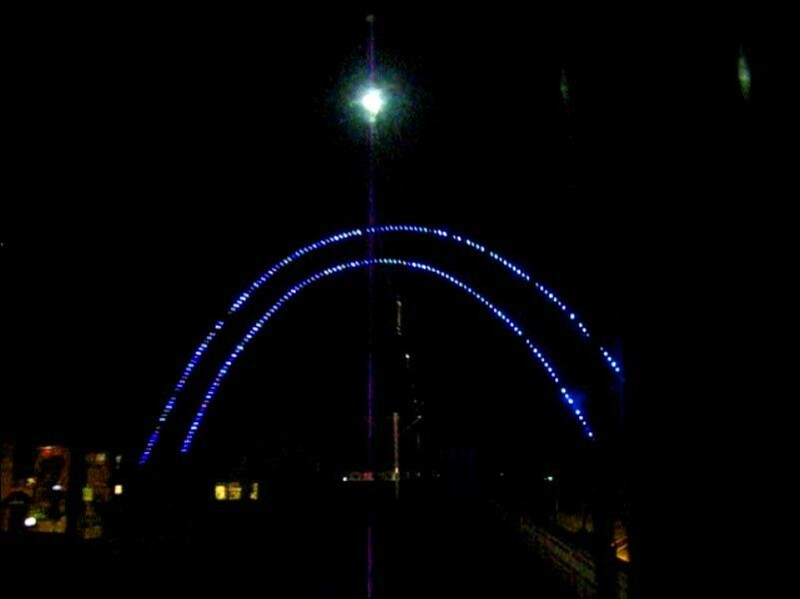 I took this picture at Ruby earlier this year after attending a memorial service for a rail operator who passed away in February. A few months after that, another rail operator became ill and died. 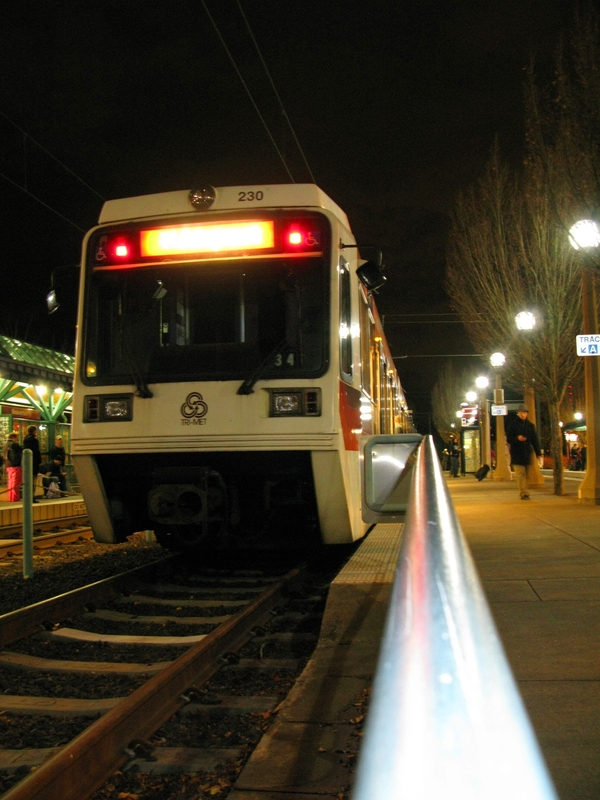 In October, a third operator died, and yesterday was the fourth rail operator death this year. All of their deaths were from health problems; none of them were in a car accident or anything like that, and all were relatively young – early to mid 50s or so. And I don’t know what to say or think. These were people who you greeted as you relieved their train or they relieved yours, joked around with in the break rooms, waved to as you passed their train and now they’re dead. I guess this is why I feel as strongly as I do about operator health benefits. This job has higher rates of death and injury than most jobs, and that’s not an abstract concept when it’s someone you know (or several people you know) who dies. I mean, did four of your coworkers die this past year? How are you supposed to react to that? That’s not even getting into the number of rail operators who have been in the hospital, needed surgery, or lost a lot of time at work recovering from work-related injury OR the number of bus operator deaths and injuries this year, and every year. So it should be understandable why the union has historically rejected pay raises in favor of compensating operators through health benefits, and why the union is so protective of those benefits – they’re needed! But there is zero coverage of bus/rail operator work-related illness, injury and death in the media, so all the public gets fed is this false image of operators kicking back and living the high life on a sweet benefits package. Meanwhile, my understanding is that the TriMet board unanimously and easily passed $947 million to fund Milwaukie light rail while refusing to put a hold on changes to union employee health insurance until it could be negotiated. So again it seems disingenuous that there’s supposedly no money to continue to care for the men and women out there running the trains and buses, but we can pass close to a billion dollars to build a rail line without a blink. 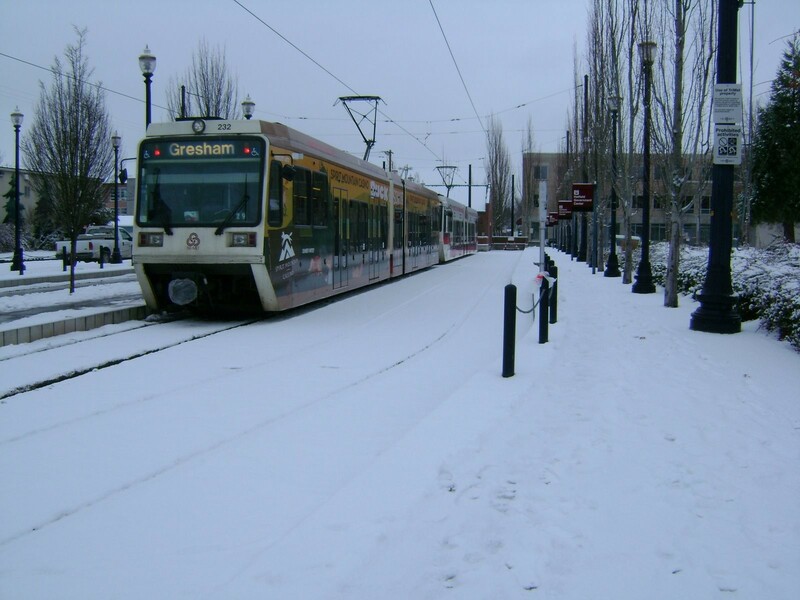 Yes I get it that that money was requested for a specific project and can only be dedicated to that project, but is it so unreasonable to think that TriMet should show equal dedication toward investing in the front line employees making it work? Although I’ve taken pictures of the Christmas tree in Pioneer Square for years, I’ve never taken one from inside a train so none of them seemed right to post. 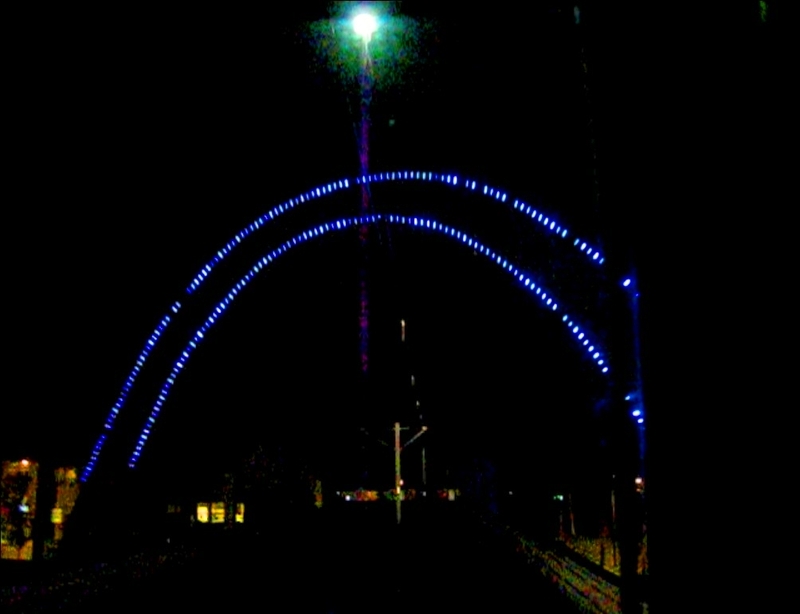 But in looking through the pictures that I have, I found some that I had taken from the cab of a train going across the Main Street Bridge west of the Fair Complex. Not really “Christmassy,” but colorful enough. Merry Christmas, from all of us here at MAX FAQs! I recently saw this Australian train safety ad – it seems relevant, considering the events of last week. I really think we need a much bigger safety outreach to the public – you can recert operators on safety training every year until you’re blue in the face, but when so much of the general public is running red lights in front of trains (and buses) in their cars or on their bicycles, pedestrians not looking both ways before crossing the tracks or pushing their baby strollers in front of moving trains, people sitting or standing or otherwise trespassing in the right-of-way, and on and on and on, that really puts an upper limit on how safe the system can be, regardless of what an operator does. And honestly, that’s one of the areas where I think TriMet’s safety committee fell short – that safety-focus came together after 5 pedestrians were struck in a crosswalk by a turning bus. Unfortunately, that happened when the victims were doing everything right: they were in a clearly marked crosswalk at an intersection and they had a walk sign. 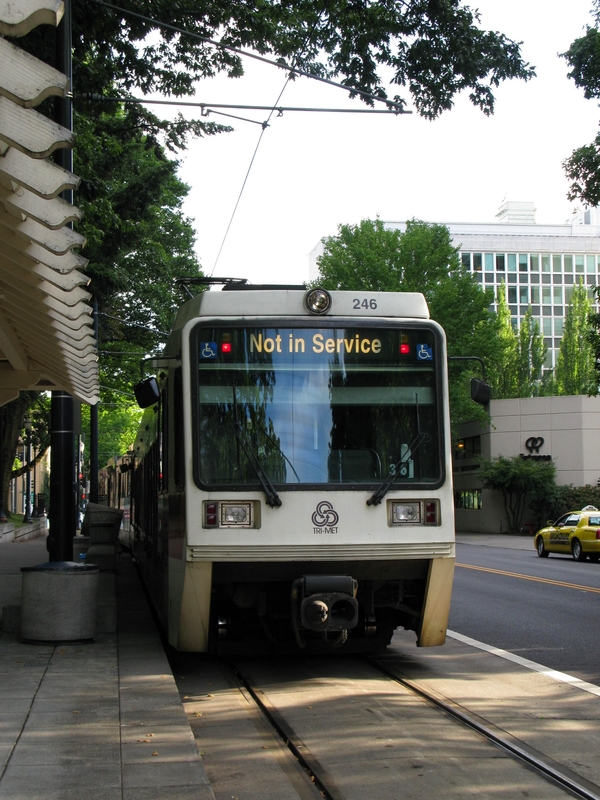 But most of TriMet’s collisions and near misses happen when pedestrians or vehicles disobey traffic signals, so focusing solely on what we can do to make operators safer misses the mark that we need the public to be responsible for their own safety as well. On one hand I can understand why that wasn’t a main focus of the safety committee because it would’ve sounded like victim-blaming in the Sandi Day incident. However if safety is going to be a “value, not just a priority” moving forward, we need to make sure the public carries their share of behaving safely – it is not all on the operators’ shoulders. And yes, that’s happened here. Australia seems to have a lot of ads and tv specials about safety around train crossings. This is another good one. Here’s an excellent British radio ad that effectively makes it’s point. 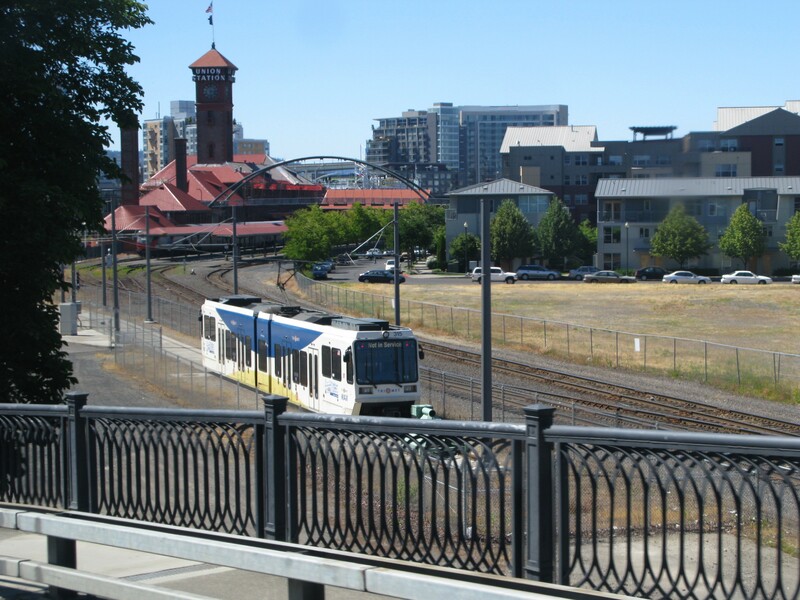 Our trains are lighter and slower than that, but a MAX train can still kill you at 10mph. And one more collision video, for good measure, since I see people gridlocking rail intersections with their back ends hanging within the train’s dynamic envelope (not necessarily over the rails themselves, but in the space that a train will take up that extends beyond the rails) all. the. time. Elsewhere, Metro Light Rail in Phoenix (the CEO of which is a former TriMet director) has a really good active safety campaign – and okay, maybe the video is a little on the hokey side, but it says things that need to be said to the public. I especially like the bulleted safety tip lists for cars, cyclists, pedestrians, and parents, and that they describe the page as “an overview of light rail safety and your responsibilities“. Most collisions with rail are preventable, and it’s not the operator who can do the preventing in the majority of the ones I’ve seen. 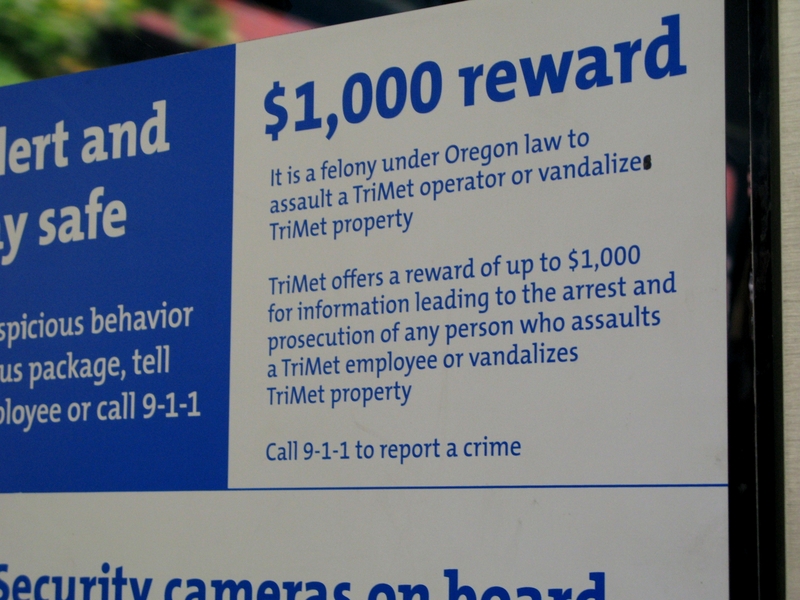 It’s not that TriMet doesn’t have any safety materials – there is a section of the website where schoolteachers can download safety posters, and there is a 15-second unpublished MAX safety ad on Youtube. Which is a start, but I think a lot more can be done, and needs to be done. Know your pockets from your tails. This post stems from some conversations I’ve had with readers lately about what a pocket track refers to, or where and what the auxiliary track at Gateway is. This is more of an alignment design topic, rather than a discussion of the physical differences between types of rail. 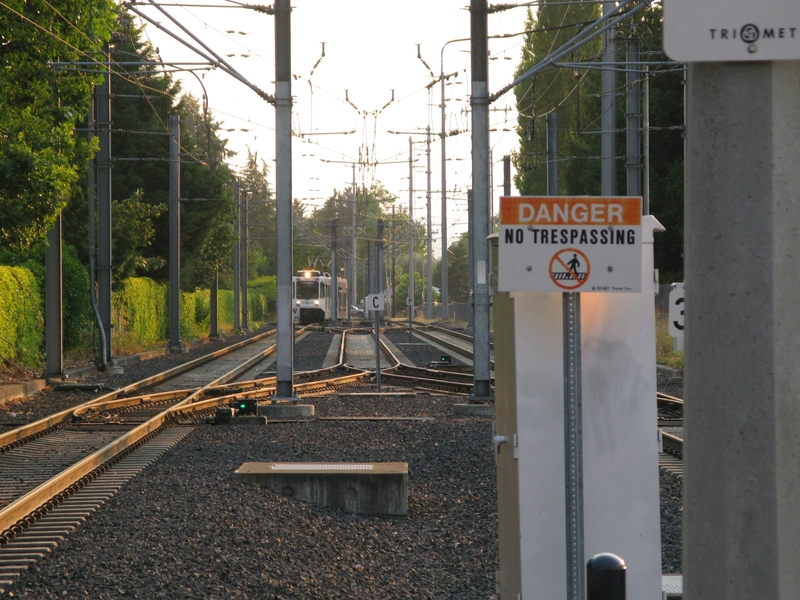 Pocket tracks are those sandwiched between mainline tracks, some of which are used more frequently than others. 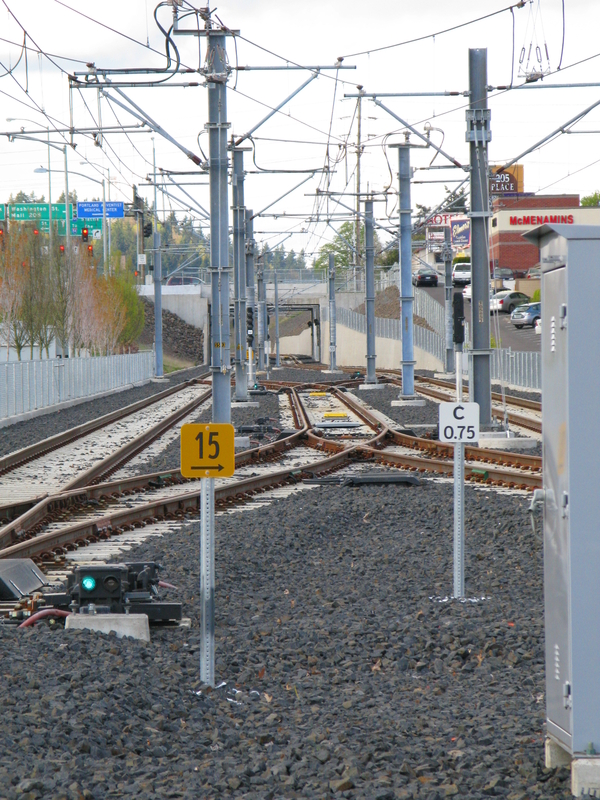 For example, Red Line trains always pass through the pocket track at Gateway to go west, and they end in the pocket track in Beaverton Transit Center, but the pocket track near Hollywood (linked photo not mine) is mainly going to be used for something like getting a disabled train out of the way and not as part of normal service. Pocket tracks are also found near the West Portal of the tunnel, near the airport, and by SE Main Street. 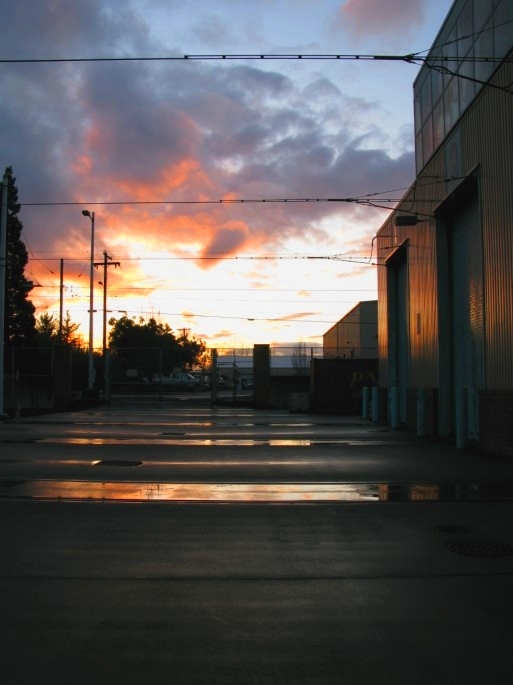 A siding is a track diverged off to the side of the mainline that can be used for turnbacks or temporary storage. Another siding under the Broadway Bridge (linked picture is not one of mine) has been used for tripper trains. 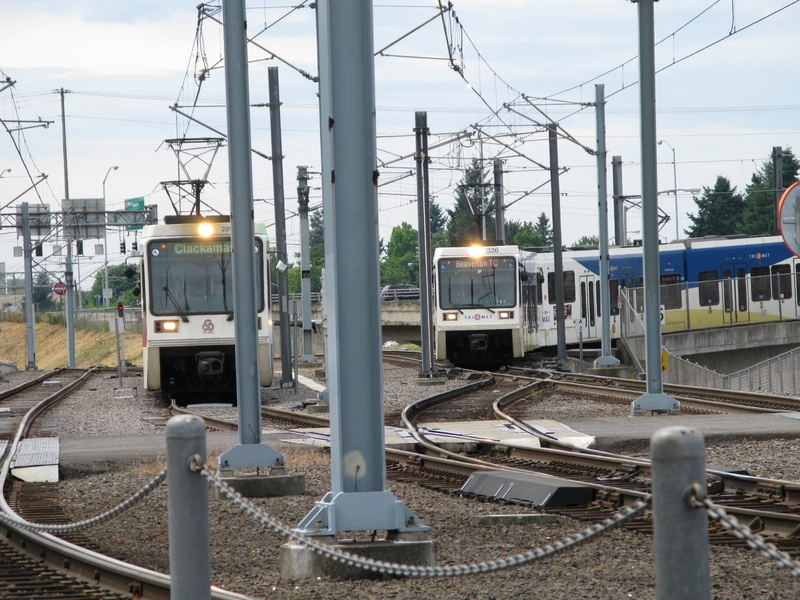 For example, some rush hour service trains that start from Hillsboro would go just past Interstate Rose Quarter, and then pull into the siding to swap cabs and go back west. 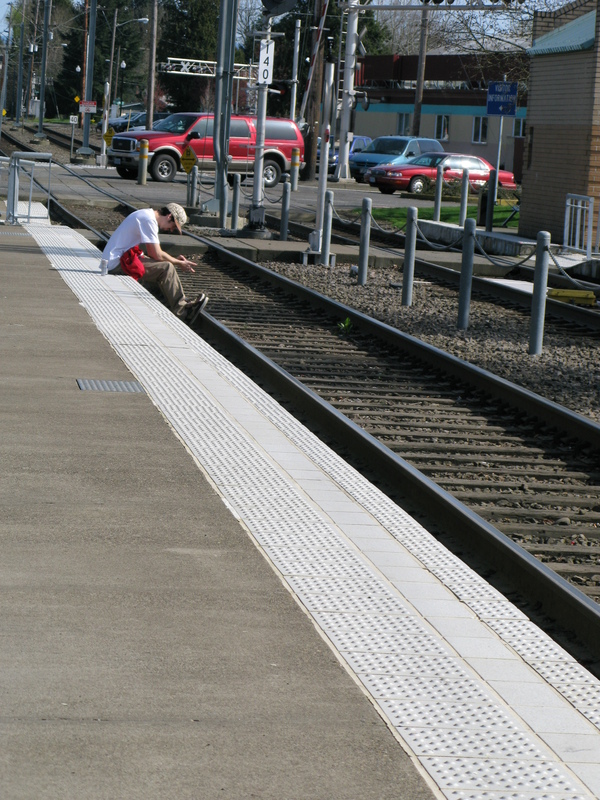 A tail track is a track just beyond the end of the line that can be used for storing a train. There are also several auxiliary tracks at different locations, such as Hatfield, Expo Center, and Gateway. The ones at Hatfield and Expo are functionally very similar: a third track diverging at the end of the line. Borrowed picture of the auxiliary track (the snow-covered one with no train in it) at Hatfield a few years ago. Gateway is actually pretty complex, so here’s a picture*, complete with my excellent MS Paint skills. Okay, so this is not quite oriented the correct way, but it’s close (for a correct view without the color designations over it, go here). The platforms are the area near the upper left corner of the picture – Blue, Red, and Green Lines using the eastbound mainline (the bottom track that has all three colors on it), Blue and Green using the westbound, and Red using the pocket track to go west. 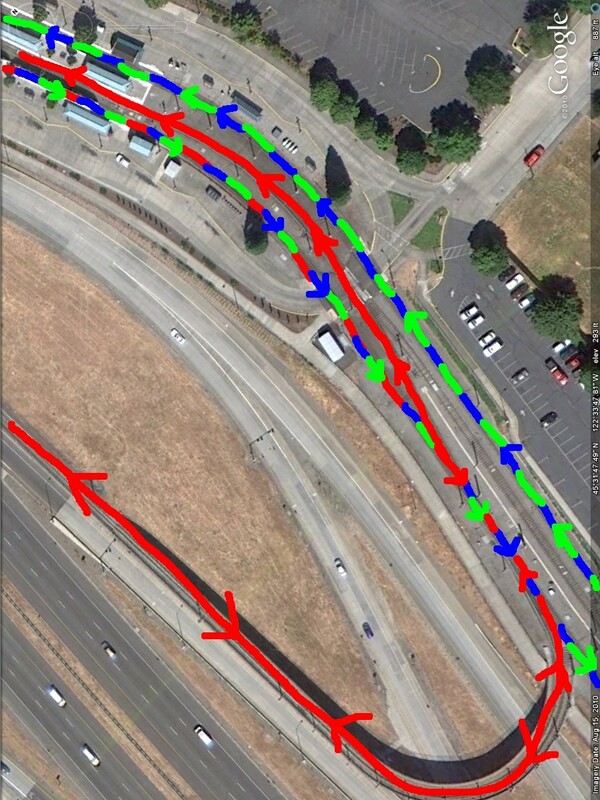 The most identifiable feature is the Red Line’s “fishhook” – a stretch of single track that connects the I-205 north alignment with Gateway. A Red Line will diverge onto the fishhook to go to the airport, and will also come back up the fishhook to go into the pocket track, which is the only track they can access to go west. 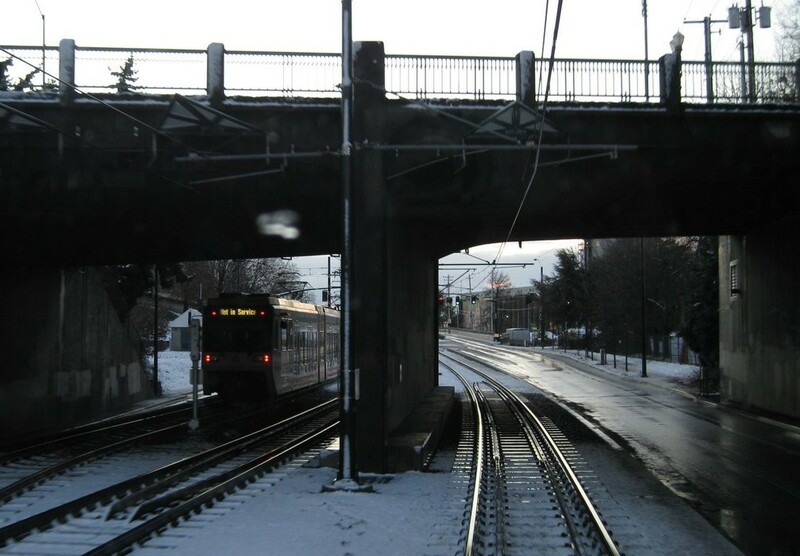 There’s no way for a Red Line to go directly from the fishhook into the westbound mainline – only Green and Blue Lines will use the westbound main at Gateway. Notice how there’s a short section of the “eastbound” track that will actually be used by Red Line trains in both directions. This is why you might occasionally be sitting on an eastbound train at Gateway for a while – an incoming Red Line could have locked you out until it gets into the pocket track. Then there is the one part of the track that doesn’t have a colored line over it, diverging off the pocket track and running between the east and westbound tracks out the bottom right side of the picture – this is Gateway’s auxiliary track. The Gateway auxiliary track is never used in service to let passengers off the train since there’s no platform there. 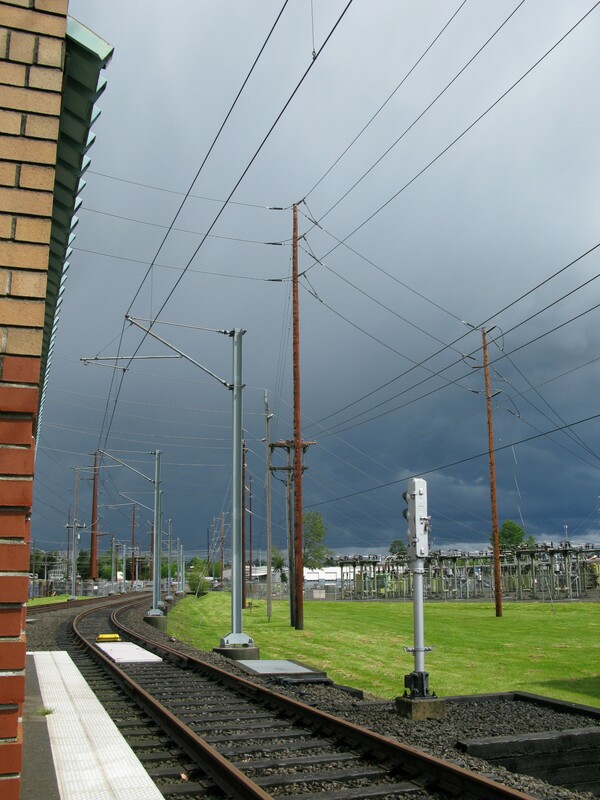 If an eastbound train needs to be moved into the auxiliary track to be stored, all passengers will exit the train in the Gateway pocket track before the train is moved there. *This picture is accurate for most trains. Green Lines going from Clackamas to the Ruby yard or from Ruby to Clackamas will use the auxiliary track to get into the pocket to swap cabs and change direction; some Red Lines become Blue at Gateway so it’ll be a Blue coming up the fishhook into the pocket track; if there’s a disabled train in one of the tracks then the pocket can be accessed from either side to get around the broken train, etc, but for most of the service day this is essentially how it works. 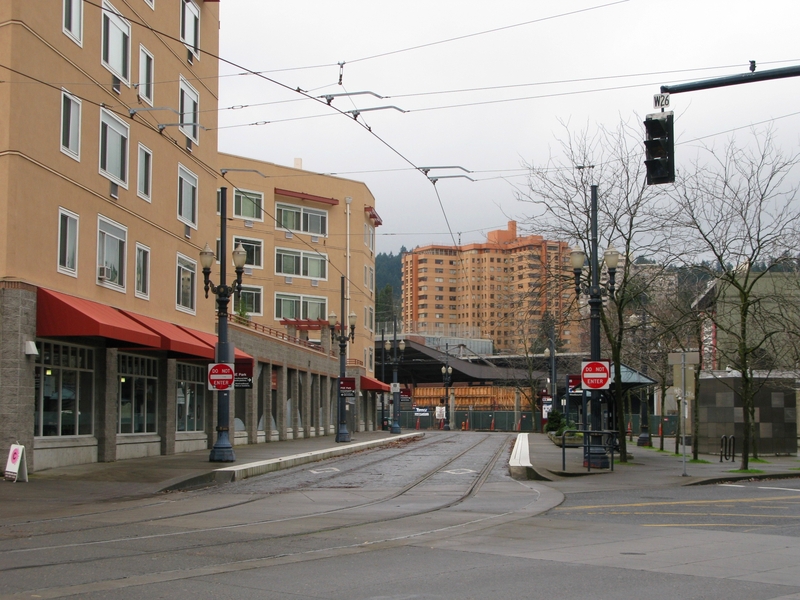 Special events tracks – these are found at PGE Park westbound and Rose Quarter (which has the same kind of layout as a pocket track, though the westbound track is not pictured in the linked photo). As the name suggests, these tracks and associated platforms are used for increased service during special events in these locations. 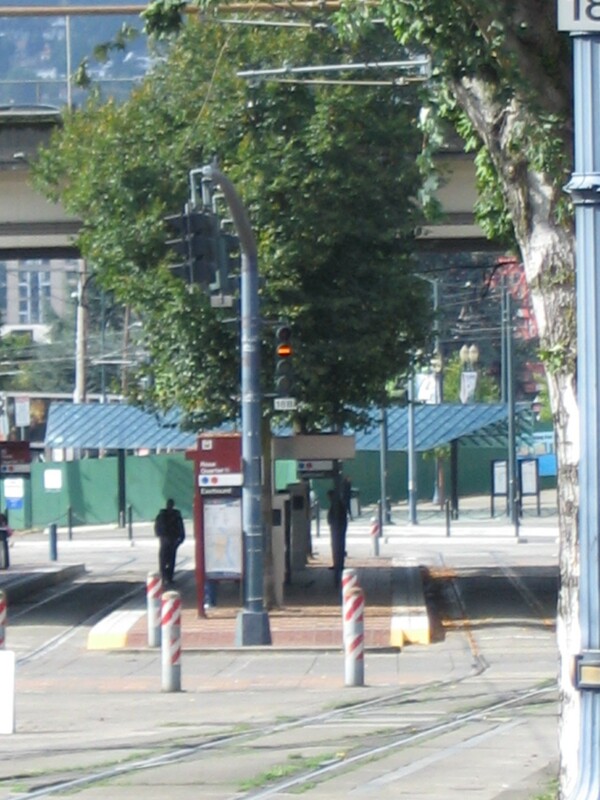 There are also two stub tracks at the north end of the transit mall by Union Station that can be used to store a train. Even though a single-car train is pictured below, both have room to store a two-car train. To summarize, all of these different types of track layouts increase the flexibility of a rail system by permitting several kinds of train movements and (when necessary) enabling malfunctioning trains to either be temporarily stored out of the way or giving other trains a route to get around them.